Absolutely. We strongly support our local drivers using Uber Rush as a delivery system. For larger events requiring setup, we will gladly provide you with a quote depending on the number of arrangements. Can we pick up our flowers? You may certainly pick-up your wedding flowers and arrangements. We will happily schedule a pick-up within a timeframe that works for you. The San Francisco Flower Mart also has a parking lot for easy pick up. That’s a rarity in the city! Are certain flowers more affordable? Yes. There are many factors that determine the cost of flower cuts including time of the year, place of origin, grower, scarcity, and others. Not only will we consult with you regarding the types of flowers available at any given season, but we will work to obtain your choice of cuts at the right price. Ask us what’s local and in season to get the best price. If I send a photo can you make that bouquet? We are happy to reproduce a design of your choosing provided the flowers are in season. Should certain flowers not be attainable during a given time of the year we will provide you with alternatives to your liking. 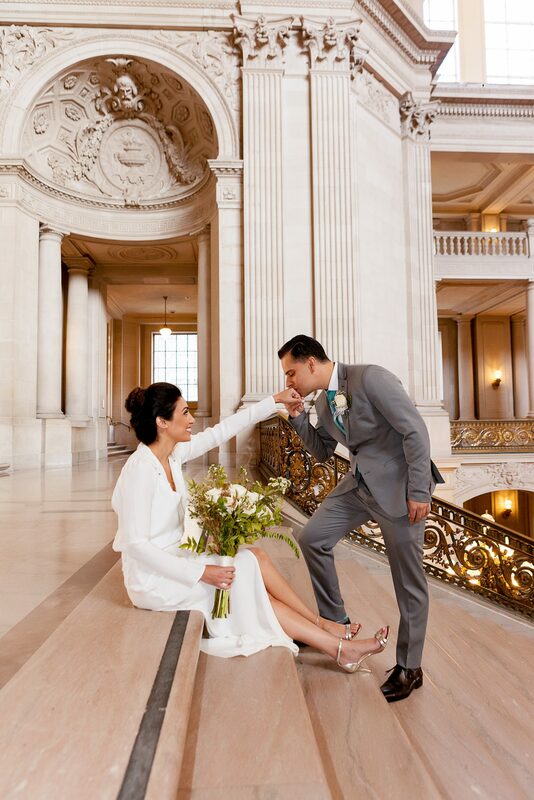 What types of bouquets work best at San Francisco City Hall? We try to suggest bridal bouquets and wedding flowers arranged with sturdy cuts so they can withstand long photo sessions and hours in the heat. 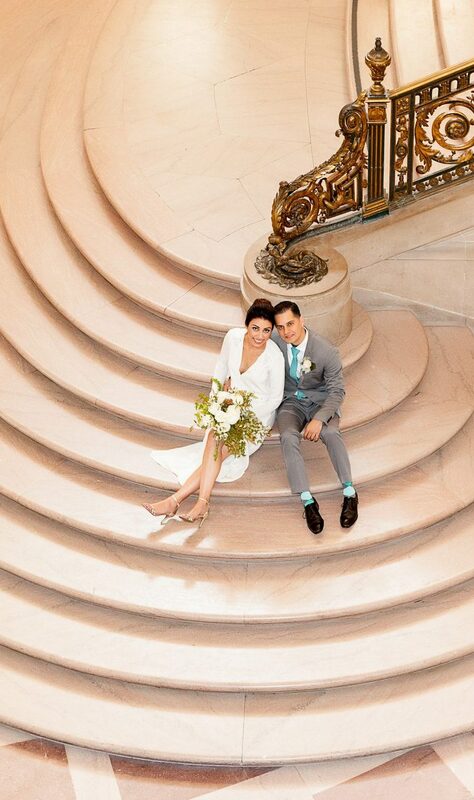 SF City Hall does get warmer than you’d expect. Our bouquets and arrangements always leave the shop well hydrated and chilled. We suggest clients keep their bouquets in their vase and away from direct sunlight when not in use. Our photographers tell us that you’ll be picking up and setting down your bouquet, many times during your photo session, so keep that in mind when planning your design. Extra large designs can get heavy after a while and a lot of hanging tendrils can break off when set down too often. Ask us about arrangements that are easy to carry, and we’ll show you some that have worked very well with past brides. 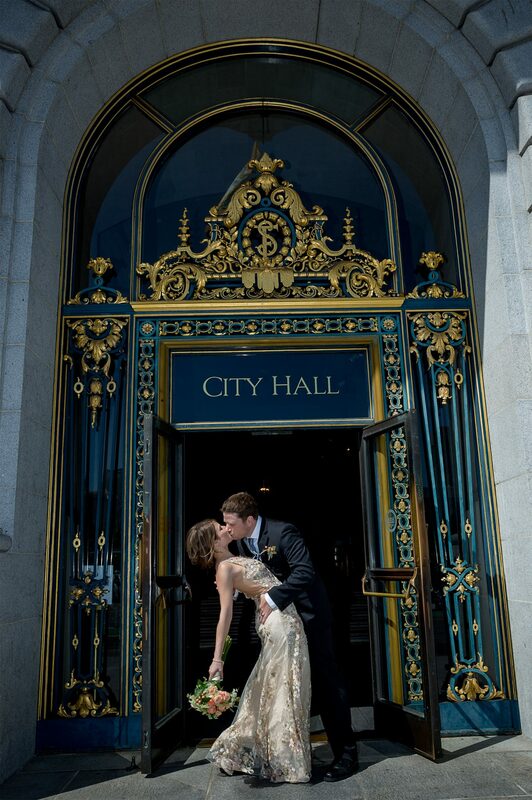 Where do we park at San Francisco City Hall? Set your GPS to 355 McAllister St. There’s just a small P for parking sign, and a ramp that goes underground. It’s right across the street from San Francisco City Hall. Can I have more than six guests? 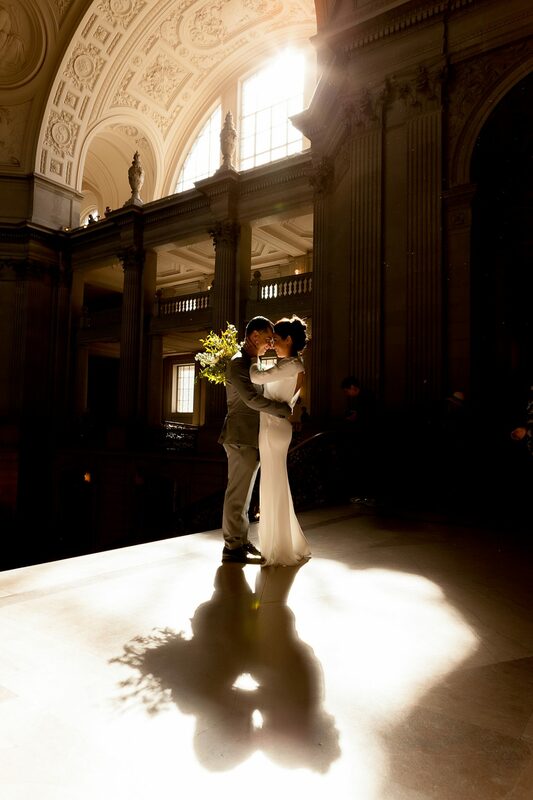 Although the City Hall website states that six guests are the maximum allowed, they don’t enforce this rule for civil ceremonies, but you should keep your guests quiet so as not to disturb other weddings that are taking place. If you know you are having a very large group, you’ll want to speak with the events department about renting one of the balconies for an hour or more. Can you suggest other vendors for us? Yes, we work with a wonderful network of wedding professionals, just ask and we’ll point you in the right direction. What forms of payment do you accept? Do I need to make a deposit? We, accept credit cards and PayPal. For weddings less than $300 we require full payment in advance. For weddings above $300 we ask for 20% deposit to secure the date and the flowers for your event and full commitment prior to your wedding.